High-Efficiency Image File Format commonly known as HEIF or HEIC is an image file format introduced by the MPE group. It is based on the enhanced pixel quality and can save a lot storage compared to JPEG. Apple has introduced the support of HEIC format in the new iOS 11. You can now capture and view HEIC images directly on your iPhone. HEIC images have some advantages over JPG format. You will be able to take a lot of pictures on your iPhone, and they won’t take too much of storage. It provides you a better pixel rate, and you can get a sharper image as compared to JPG format. HEIC format supports 16-bit colors which makes your photos more colorful with enhanced details. 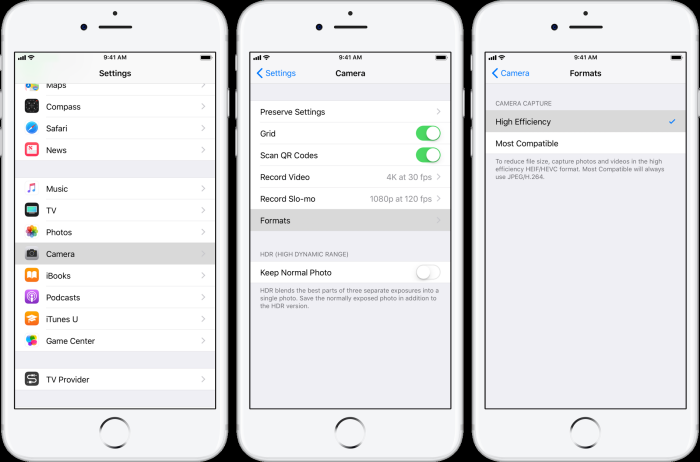 How to Set iPhone to Capture HEIF/HEIC Quality Photos? Simply follow the steps mentioned here to set your iPhone to take HEIC photos. Step 1: Go to your Settings app and click on Camera. Step 2: Here you will find Formats option. Tap on it. Step 3: Now choose High-Efficiency option, and it will set the iPhone to the HEIC capturing. We are introducing a safe and secure method you can use to convert your HEIC photos easily. iMyFone HEIC Converter is a great tool that can help you in several ways. Whether you are viewing HEIC photos on your computer or you want to convert them into JPG, you can do all of this stuff by using iMyFone HEIC Converter. It is a fast, easy to understand and reliable software. It comes with some different features. Have a glance at some of them below. Convert unlimited photos on your computer by using iMyFone HEIC Converter. You can convert more than one photo at the same time. It means iMyFone HEIC Converter will save a lot of your time while converting the images. You can trust this software as it works locally and none of your private photo will be exposed. You can easily convert your photos without damaging their quality even a little bit. If you are new to iMyFone HEIC Converter and don’t know how to convert your photos, we will help you by telling following useful points. Step 1: Open iMyFone HEIC Converter on your computer. 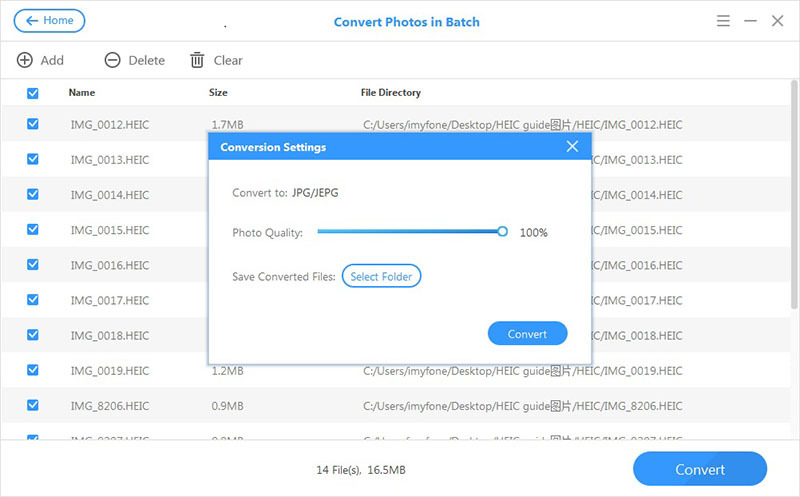 Step 2: Now either click on Convert Single Photo or click on Convert Photos in Batch according to your requirements. Step 3: Now simply select the files and click on the Convert button. Here you can also select the photo quality. 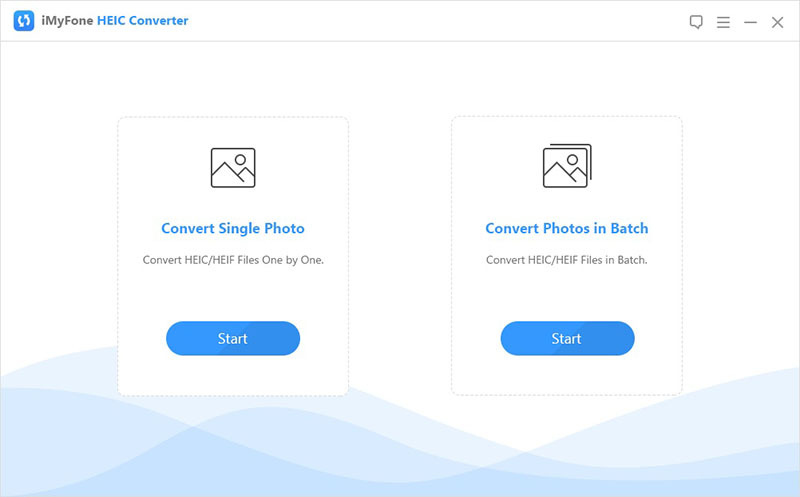 If you want to convert your HEIC photos into JPG, you can easily do it on the internet. Step 1: Go to heictojpg.com and click on Choose .heic(s) or Drop Them Here. Step 2: Now choose the photos you want to convert to JPG. Step 3: Finally, click on convert and it will perform all the procedure in a short period of time. You can easily convert your files online, but there is a risk with your photos as it will upload your photos to their database before conversion. So converting your files online is not a very good idea.